Indulge in effortless youthful sophistication courtesy of the alluring Michael Kors Darci timepiece collection. This chic bracelet watch is styled with a pavé-embellished bezel and plum-hued setting render this timepiece colourfully cool. Team it with silver or gold-tone pieces for a pretty pop. 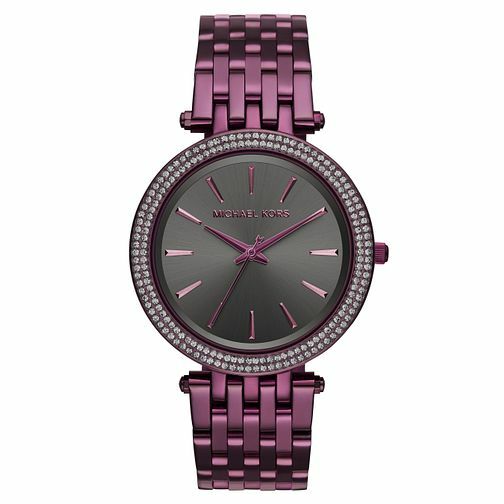 Michael Kors Darci Ion Plated Ladies' Plum Bracelet Watch is rated 5.0 out of 5 by 1. Rated 5 out of 5 by Anonymous from good purchase Fair price. Quick delivery. Quality product Very happy Thankyou !